Each gospel commentary begins with a prologue: this page has the beginning of the prologue for the one on John. The scratches and marks in the margins indicate how much it was used: Nicholas of Gorran's commentaries were still being published in the 17th century. 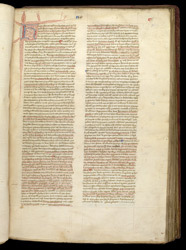 The word in the left margin corrects an error, and the small letters in the lower right corner are aids for assembly of the manuscript.